Characterisation of rough surfaces. The shear strength of granular materials is ultimately determined at the interface scale between two grains. Key parameters include contact stiffness, friction coefficient and capillary interaction. While connecting the microscopic quantities with the engineering applications, fitting procedures at the grain scale were often made to achieve good agreements with macroscopic benchmark experiments. Rather than using this end to justify the fitting processes, we are looking at extracting measurable material properties at the lower scale(s). In particular, we employ mechanical and chemical surface treatment for alternating the surface structure, microscopy (optical profilometer, atomic force microscopy) for characterising the surface topology, and nano-indentation for mechanical testing of the surface interaction. 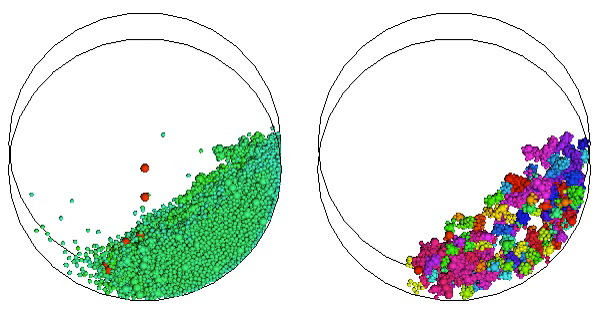 With the coexistence of multiple phases (solid, gas and liquid) in granular materials, we examine the dynamic interplay among them via computational (molecular dynamics, smoothed particle hydrodynamics, discrete element method, and lattice Boltzmann method) and experimental approaches developed in the lab. 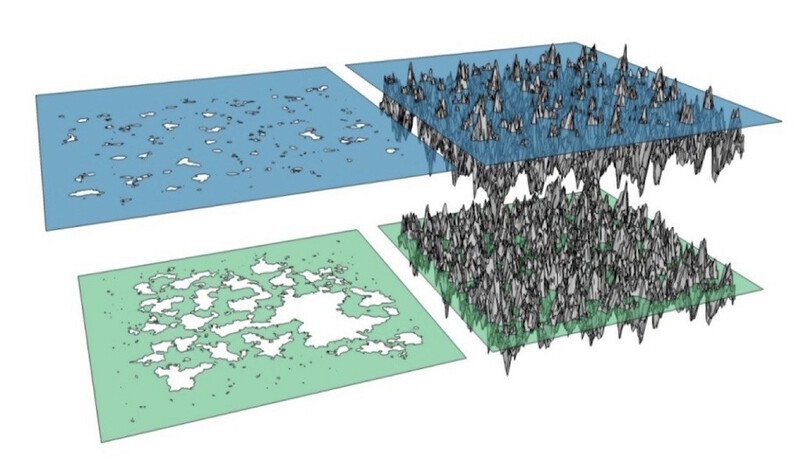 We are also developing numerical tools for generating, analysing and simulating rough surfaces, and finally integrate these interfacial information into a hierarchical constitutive framework to pass essential parameters (and their evolution) to the engineering scale. Contact angle hysteresis in capillary bridges. The contact angle is the angle where a liquid-gas interface meets a solid surface. Taking into account the themodynamics potentials associated with the given liquid-gas-solid set, we study experimentally the dynamics of the contact angle during the natural evaporation and mechanical pull-off tests. Partially saturated granular materials. We developed a particle-water based discrete element method (CapDEM) for including the liquid contribution from both capillary bridges, dominant at low saturations, and the pressure of entrapped air, dominant at high saturations. The approach captures the hysteresis of water retention during wetting and drainage by introducing the local evolution of liquid-solid contact angles at the level of pores and grains. Phase-change granular media. In this research topic, we established a DEM code with meltable grains (Meltable-DEM). Using this modelling tool, we are studying (1) earthquake fault dynamics and generation of pseudotachelyte rocks; (2) the release of wet snow avalanches; and (3) phamaceutical powder processes. Mechanical (in)stablity of grains. We study the crush loads of individua grains, usually ceramics, to have a Weibull-type distribution, enriched by the size effects. We focus on lithium orthosilicate pebbles, a candidate tritium breeder material for fusion energy. This type of pebbles has been made by Kalsruhe Institute of Technology, and has a very good quality control with good spherisity and stable chemical composition. 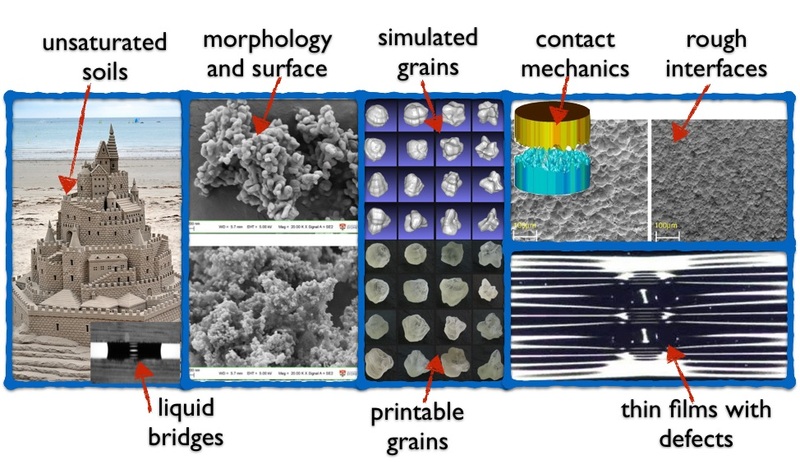 Transport phenomena in granular materials. In energy systems, granular materials are commonly used to store, convert, capture, and produce energy. Examples include thermal storage systems, lithium-ion batteries, and solid oxide fuel cells. The function of granular materials in energy systems involves essentially the transport of electrons, heat, and ionic species. Controlling the performance of such systems is encumbered by complex multi-physics interactions of matter and structure across a large range of length scales. Understanding transport phenomena, by means of a framework that combines lower and higher scale features in granular matter, will facilitate the optimisation of the functionality of energy systems and reduce their risks of failure. We establish constitutive frameworks for upscaling from the grain-scale to the effective properties, including mechanical, thermal and electrical properties. Thermo-mechanics in compacted granular media. Granular materials are frequently subjected to ‘extreme loading conditions’, i.e. conditions that involve high compaction, severe shearing and elevated temperatures. Understanding their thermo-mechanical behaviour is essential in many applications, e.g. for optimising and reducing risks in granular heat exchangers, extracting methane hydrate from deep seabed, increasing stability of carbon storage in reservoirs, and resolving the rate-and-state behaviour in fault dynamics. This topic initiated from my doctorate study in Karlsruhe, details can be found in my dissertation (link). We are looking at the approach combining the discrete and continuum mechanics for optimisation of granular systems under elevated temperature, severe mechanical loading and hostile environments.